I have been experimenting lately with some higher dimensional systems based on the platonic solids and here are some of my results. I have used the mandelbox equation for all of them, since its very simple to use. But you can also use others.. The formulas are in simple C format and in most cases, I didn't have optimized them in order to maintain clarity. I have posted this formula before, its on the Quadray post. The main difference between the old formula and the presented one is the fact that setting the delta value to 3, generates the tetrahedron, while a value of 0 generates the octahedron (also, this is array based, the old one used variables). const float vsq=vm*vm;//-vm*vm for fun!! I have another Octahedron formula (6D) but its slower than this one..
For the Cube, well, everyone knows the Mandelbox, so I will skip it.. This is a large formula, it has 12 Dimensions and if you plan to render it, I recommend you to use GPU.. This formula is..well.. it's complicated.. mostly because it has 20 dimensions..
Oh, they will really not mix with their lower dimensional counterparts..the reason..well..its just like the old joke of the ant and the elephant.. I mean, the Icosahedral formula is 20D, while the original box is 3D.. Size matters..
As for the folding, I have a quadray fold, that turns the 3d point into a quadray, calculates the folding and then applies the inverse quadray transform, in order to return to 3D.. there are variants for the higher dimensional, but I'm still creating their inverse forms.. Interesting stuff, and beautiful images Aexion! Does the mandelbox actually use euclidian spacial geometry? so you are saying, fold planes YZ this way and fold planes XZ that way? in that case could you also fold the mandelbox according to different planes like those in dodecahedrons and tetrahedrons? that would look pretty amazing! 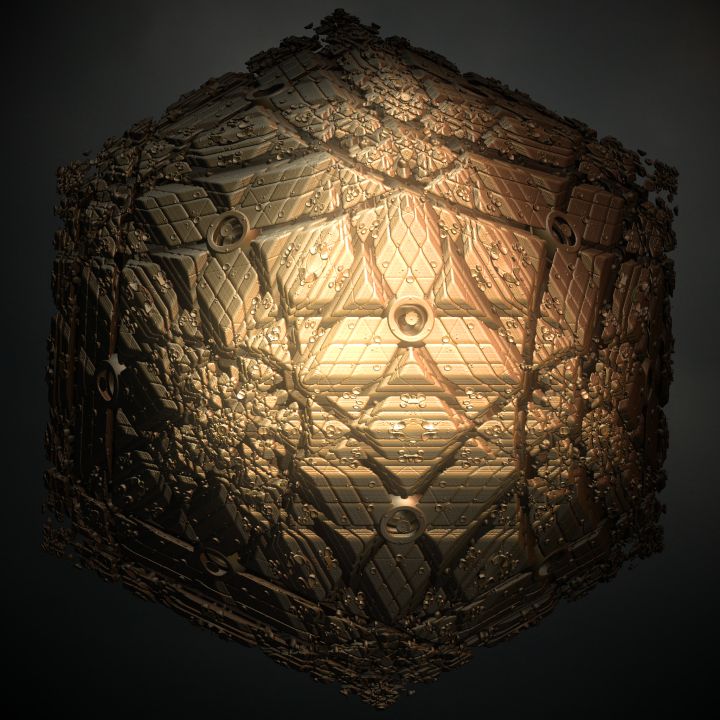 5 sided 3d geometries are fantastically pleasing to look at. 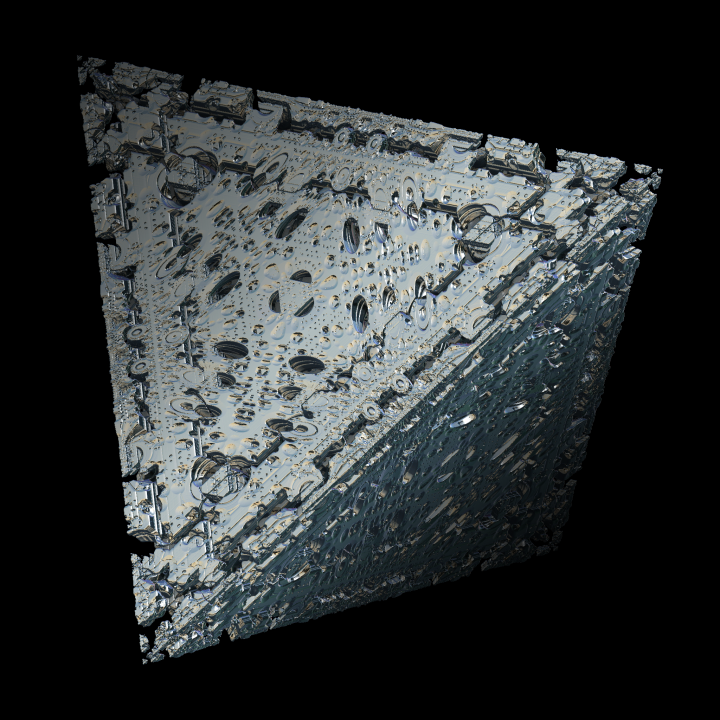 can you make a trapezoid mandelbox? And what about dodecahedral and octahedral menger sponges? 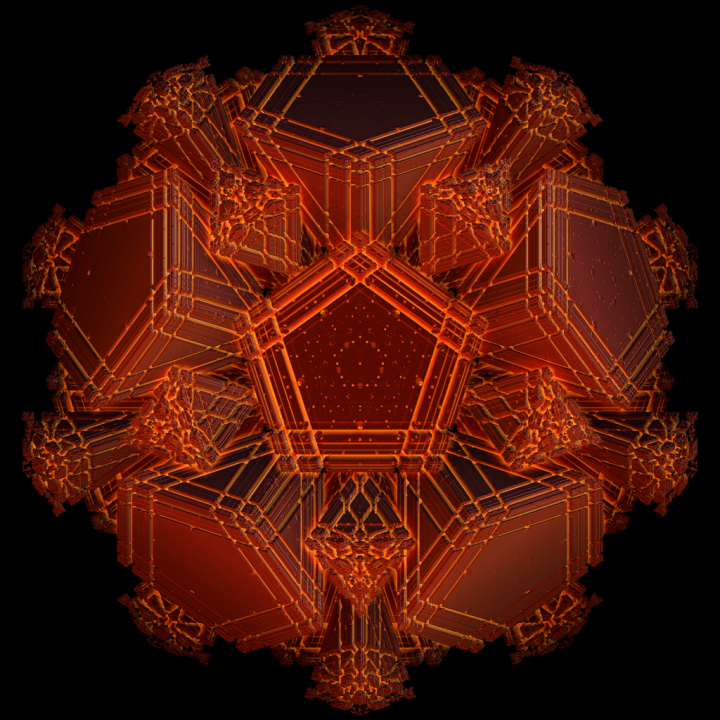 The third from the bottom here is dodecahedral folding, by Blob. What about folding with mixed polyhedron shapes, cube, tetrahedron and octrahedron in the same folding algorythm? and introducing a spiral element into the folding, i.e. every time rotate the folding angles by 1 degrees relative to a central point, axis, etc, and transforming the folding planes outwards, right, up, etc. ? These images illustrate the notion of dimensionality is not that of perpendicular directions, but rather that of orthogonal directions. The difference is the difference between generalised coordinates and 3d rectilinear coordinates. There is a second no less significant evolution: the ability to apprehend the subjective viewpoint, and the subjective processing that takes place in computing the output surfaces, colours and intensities. This is how far we have come, and you gentlemen are at the bleeding edge of a brave new fractal worldview. It was very surprising to me that the ordinary Mandelbox DE worked - since we return the length (and running derivative) of tetrahedron coordinates, and use these as a distance estimate in our normal 3D coordinates. There are many 3d surfaces to explore..
Oh, try the other functions..
Works very well with low iterations.. Anyway, I optimized the formula (calculating sin&cos in one shot to gain speed), and found a way to reduce the busy and discontinue aspect of the fractal in a simple way. When adopting this expression I noted that for a lower frequency (0.3 seems to be a good value) the fractal begins to look more harmonious. I only need to implement the "cos(f*x)+cos(f*y)+cos(f*z)" terms, adding another Amplitude value. Test renders soon!